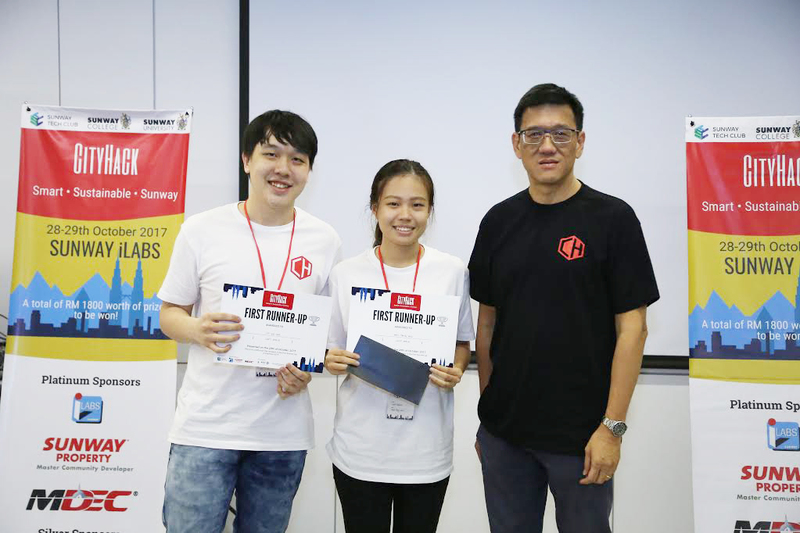 UTAR Bachelor of Computer Science (Hons) student Hew Teng Wei with her teammate Software Engineering student Lee Wei Fan from Sunway University, won second place at the “CityHack Hackathon 2017” held from 28 to 29 October 2017 at Sunway iLabs, Menara Sunway, Subang Jaya. “CityHack Hackathon 2017” was organised by Sunway Tech Club of Sunway University with Sunway iLabs, Sunway Property and Malaysia Digital Economy Corporation Sdn Bhd (MDEC) as the platinum sponsors. Themed ‘Enabling a Sustainable Sunway City through Hacking’, the competition aimed at providing university students with a platform to collaborate in solving problems through innovative solutions that will contribute to a smarter and more sustainable Sunway City as well as to help them keep up with the trends of the Fourth Industrial Revolution. In addition, the competition also provided a chance for the participants of diverse educational background to work together, broaden their horizons and channel their unlimited self-expression and creativity through technology. Hew and Lee, who knew each other since high school, mentioned that they had the idea of operating hospital machines without the need for physical contact, in order to reduce the spread of germs, even before the competition. With them securing the second place, the team credited their win to good teamwork and time management, which also enabled their project to stand out from the other competitors. They walked home with a cash prize of RM500 and a certificate each. “We knew that the competition would be a good platform to refine our ideas. Hence, we used it to solve the challenge in the competition. We’re really surprised to have won the second place, but at the same time, we feel excited. Having the opportunity to gain exposure to the technological developments that would help us work on our project with an actual programme that has a user interface (UI) is certainly rewarding,” enthused Hew. Hew also expressed her gratitude to Faculty of Information and Communication Technology lecturer Dr Kheng Cheng Wai for all the programming concepts and practices he has taught. It greatly helped her when applying the fundamental of programming in her project. The team created a project that uses Leap Motion technology which controls and operates a computer system in a hospital without the need of physical contact. The project is divided into three parts, namely “Leapmed”, “Leap View” and “Leap Cafe”. “Leapmed” is a queuing and ticketing system that provides a gesture control to reduce the need of physical contact with the ticketing machine, whereas “Leap Viewer” is a programme that allows medical field personnel to control a display without touching it, thus avoiding the need of sanitising the hands after every physical contact with the interaction panel. Lastly, the “Leap Cafe” is a food ordering system which automates the food ordering process, enabling it to be done remotely from the hospital cafeteria.